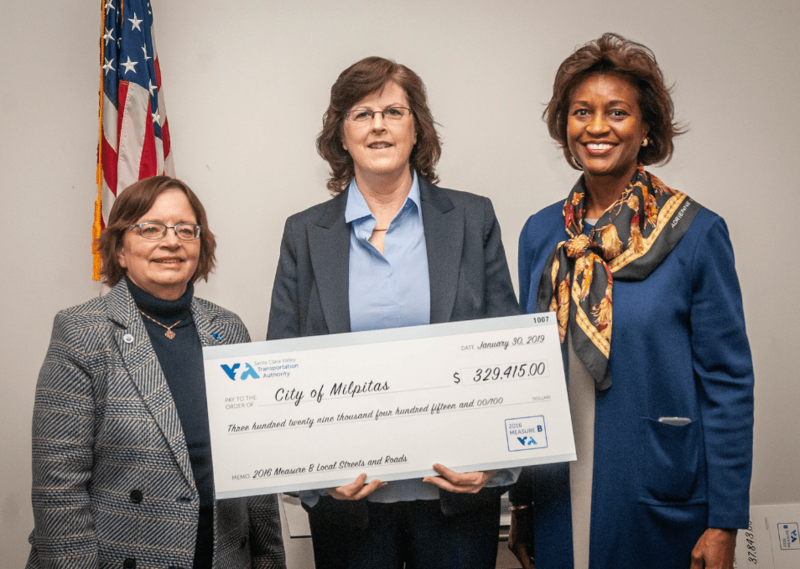 The City of Milpitas is set to receive the first installment of 2016 Measure B funds from the Santa Clara Valley Transportation Authority (VTA) for local streets and road improvements. The anticipated $329,415 advance will directly contribute to the annual Street Resurfacing Program, providing much needed dollars to roadway pavement repair throughout the City. In addition to the one-time advance, Milpitas expects to receive dedicated money for this program on an on-going basis, projected to be approximately $1.38 million annually, over the next 30 years. In addition, VTA currently has $1 million of 2016 Measure B funding programmed specifically for Calaveras Near Term Improvements. Santa Clara County voters approved 2016 Measure B, a 30-year, half-cent countywide sales tax to enhance transit, highways, expressways and active transportation (bicycles, pedestrians and complete streets). The measure passed by nearly 72%, the highest level of support for any Santa Clara County transportation tax. The release of 2016 Measure B funds have been held in a legal challenge, which was denied by the California Supreme Court on January 23, 2019. The funds collected over the nearly 2 years since the measure passed have been kept in an escrow account, currently totaling roughly $340 million. VTA celebrated the California Supreme Court’s favorable ruling by presenting the City of Milpitas with a commemorative $329,415 check, symbolizing a one-time advance amount for Local Streets and Roads maintenance and repair, at an event held this morning at VTA headquarters. Included on the agenda for the February 5 City Council meeting, Council will consider the establishment of a Transportation Subcommittee led by Mayor Tran and Councilwoman Carmen Montano. 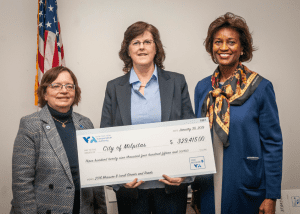 The genesis of the concept was conveyed by Councilwoman Montano at a Council Budget Study Session held January 29 in acknowledgement of a number of transportation related issues identified as top priorities for the City. The Subcommittee would be charged with developing innovative solutions to address traffic, bike baths, street maintenance, parking, etc. Additionally, through this Subcommittee, the Milpitas community could provide input on how best to leverage 2016 Measure B funding, particularly as there are a number of grant opportunities available to go towards meeting the transportation needs of Milpitas residents and businesses.